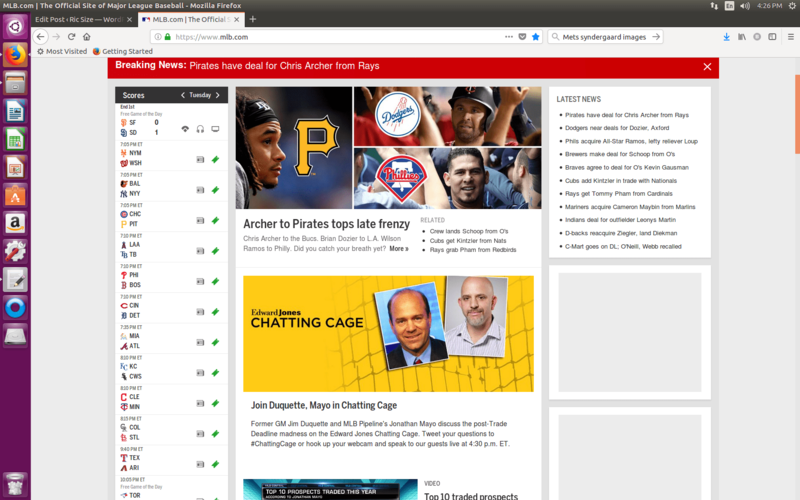 If you’ve been through a few MLB Trade deadlines (and I have), then you know this is a feeding frenzy. You have two sub-sets of teams; those trading away MLB assets for prospects & young talent, and those competitive teams acquiring winning MLB talent. Everyone is trying to improve themselves, whether the focus is on this October, or the future. The most-coveted MLB asset for championship contenders is top-tier relief pitching, as that’s what October baseball comes down to. Who can get those crucial final outs from their bullpen? The most coveted return for sellers are top prospects: top-100 MLB prospects, top organizational prospects, top pitching prospects, top left-handed pitching prospects, etc. Position players are added for depth, and to plug holes, but they don’t move the needle towards winning like relief pitching or front-line starters. The fascinating (and mostly unmentioned) thing about this trade deadline is that Padres GM AJ Preller held aces on both ends of this spectrum, and once again exerted influence & control over the trade market. He dealt coveted lefty closer Brad Hand (and righty set-up guy Adam Cimber) on July 19, 2018 to Cleveland, in return for C Francisco Mejia, their top prospect– ~15th overall in MLB. The Padres needed a catcher, as Austin Hedges is elite defensively, but isn’t the everyday answer. Hedges is an elite caddy in a catching tandem. Padres won’t be dealing Mejia, you can be sure. 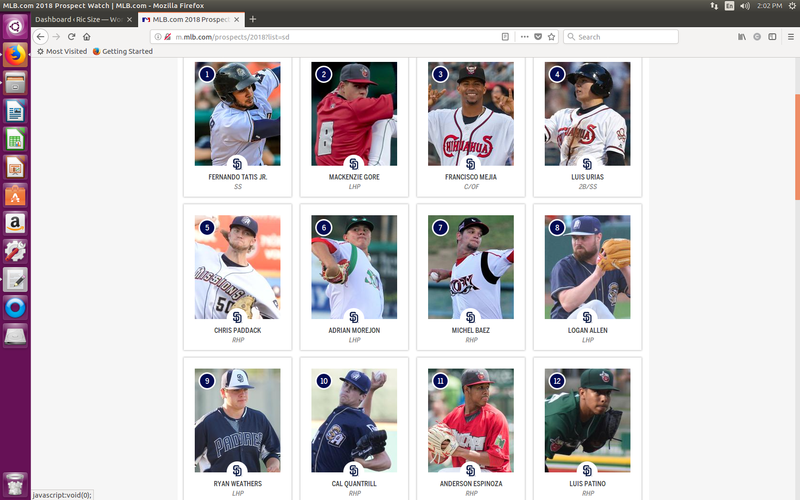 As the above screenshot indicates, Francisco Mejia currently ranks 3rd in the Padres stacked farm system– behind SS Fernando Tatis, Jr. and LHP Mackenzie Gore. The list of talent in this top-12 is the envy of MLB. There are more-than-a-few teams in MLB who don’t have a single player in their farm system that is better than any of the Padres top-12 prospects. This represents championship level talent at bargain basement salary, which means you can keep it together. Every savvy GM & organized front office understands that. This is what put the San Diego Padres in the RHP Chris Archer trade conversation. Any GM of a last-place team needs to look at ways to improve their starting pitching. AJ Preller did this, but what the Rays wanted in return was too high a price. Besides, Chris Archer isn’t an ace. He’s a valuable #2 starter on championship NL roster, and a #3 in the AL. AJ Preller knows you don’t give up the farm for that, especially at this point in their competitive cycle. Padres don’t need to pay Archer’s (affordable) salary either. So what was Preller doing? He was doing what any good GM in his advantageous position should do, test the market and get an idea of how other organizations value your prospects. It turns out that rival GM’s value Padres prospects very highly. More reason to hold onto them. There was non-stop speculation from the MLB/ESPN driven media, that the Mets were going to deal their “aces.” Let’s back up for a moment here. First, the only ace the Mets currently have is RHP Jacob deGrom, and the Mets have said repeatedly they don’t want to trade him, unless it’s an offer that’s over-the-top and they can’t refuse. Nothing of the sort was ever presented. 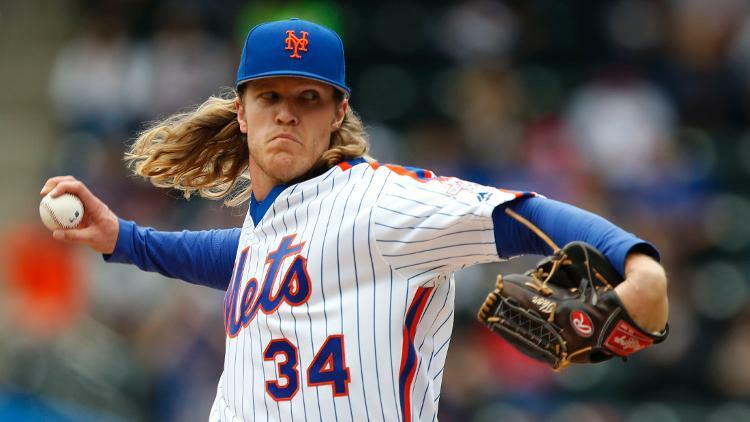 Somehow by mentioning a deGrom trade possibility through the media, the Mets front office reasoned that would make RHP’s Noah Syndergaard (above pic) & Zack Wheeler appear more valuable. It doesn’t work that way with astute GM’s. Let’s examine the true trade value here. The best pitcher the Mets actually had available was Syndergaard. The problem is he never stays healthy, and he just went on the DL again, this time with hand, foot & mouth (HF&M) disease. HF&M disease is a viral infection, that wipes you out– similar to mononucleosis or hepatitis. No team wants to bring a carrier of a contagious disease into their clubhouse. Yet the MLB/ESPN sports media kept trying to push a trade possibility, and it (curiously) was often linked to the Padres, as they have the prospects to make it happen. The media also underplayed the causes of HF&M disease, which is poor hygiene, not washing your hands, etc. A responsible MLB GM can’t blow that off as incidental. It says something about who that person is, and their intellect. Unlike a bone fracture or muscle/ligament tear; this could wipe out an entire clubhouse– for a month or more! The kid may have talent, but his head is a huge question mark, along with the Mets medical staff. Therefore Noah Syndergaard is definitely not worth the gamble of trading away the farm system to obtain. The Padres would rather keep top LHP prospect Mackenzie Gore, and that’s what AJ Preller did. Zack Wheeler was endlessly floated over the past few weeks as a starter that could help a contender. He’s viewed by GM’s as a #4/5 guy- so that was a non-starter. Wheeler was the beneficiary of possibly the worst umpiring decision in the history of MLB, in a recent start against the Padres at Citi Field. This trade deadline was most cruel to the New York Mets, who are currently 44-59, sitting 4th in the NL East with a bad farm system, and unable to trade any of their best starters for the prospects they so desperately needed. The Mets team owner is bankrupt, so winter free-agent splashes are probably not an option. That’s an Amazing Mess. As mentioned, all the serious focus up to the deadline (outside of Chris Archer) was on top-tier relievers. AJ Preller still held the best cards in this market, even after dealing Brad Hand. Reliever Kirby Yates (1.60 ERA and a 0.89 WHIP) is controllable through 2020, and Craig Stammen has a 2.63 ERA, with a 1.11 WHIP. They both have been used frequently, and in high-leverage situations. Those were (by far) the best available reliever options, as the trade deadline passed. An actual problem at this point for AJ Preller is that no GM wants to trade him any more prospects. 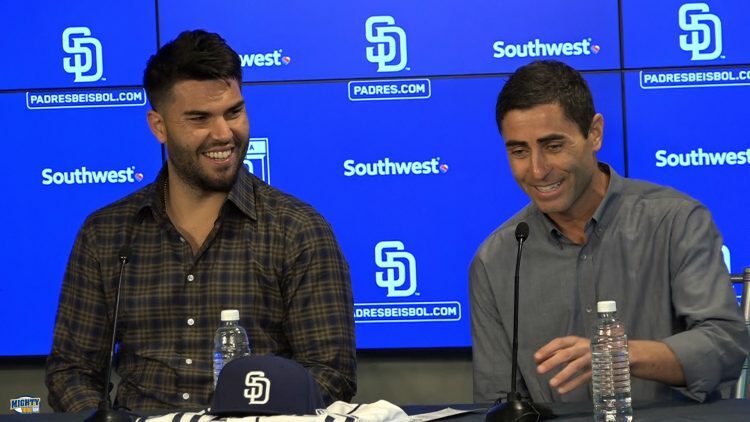 They see the Padres future, and they don’t want one of their own to be part of it. This slightly suppressed the value for everyone else, since Yates & Stammen were the top of the bar. After the deadline both are still Padres, despite all the media talk that they would be dealt to contenders. Wrap-up: The fact is that in another year or two, all of the names on the Padres top-30 prospects list are going to be either: 1) producing in the majors, 2) knocking on the door, or 3) washed out. Not every top prospect makes it, but the level of talent and unbelievable depth in the Padres system makes them the odds-on favorite to become the next Houston Astros. The Padres will be doing it in the easier league, with an AL-type roster and organizational depth built around power pitching & hitting. They are in this position because of their general manager, who is a baseball & organizational genius.